The year was 1735, and on the plains of Menuma in present-day Saitama Prefecture, master builder Hayashi Masakiyo was going from village to village assembling a group of top-class carpenters, engravers, painters and other artisans. In fact, that major project was no less than a reconstruction of the main building of Kangiin Shodenzan Temple, which was founded in 1179 by Lord Saito Betto Sanemori to enshrine the Buddhist god, Shoden. Nowadays, the fruits of Hayashi’s vision — finally realized after his death by his son, Masanobu, in 1760 — are plain to see in the marvelously detailed and lavishly colored wood-carvings that adorn the exterior walls of the main building (known as Shodendo), though its decorative arts now appear to some so incredibly gorgeous as to be a bit too gaudy. Indeed, such splendor was out of step with those ancient times, too, when architectural art was increasingly aiming for simplicity and refinement. 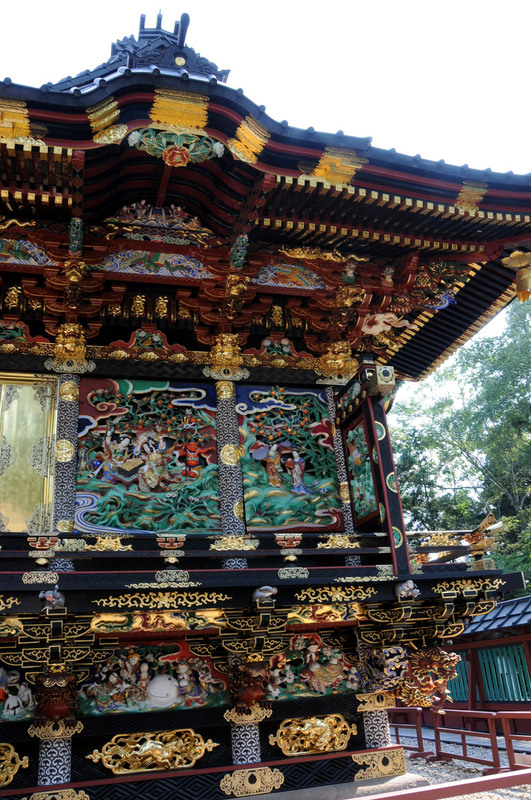 Nonetheless, Shodendo’s allure rests mainly in its plethora of astonishing wood carvings. 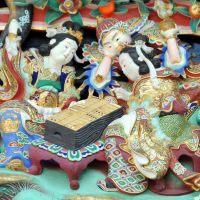 These include expressive monkeys, cats, birds, elephants and imaginary phoenixes, as well as scenes of children at play — some sumo wrestling; others making a huge snowball to drag with a rope. All this makes appealing reading — but anyone visiting Shodendo 10 years ago would have likely not noticed any of these intriguing details. 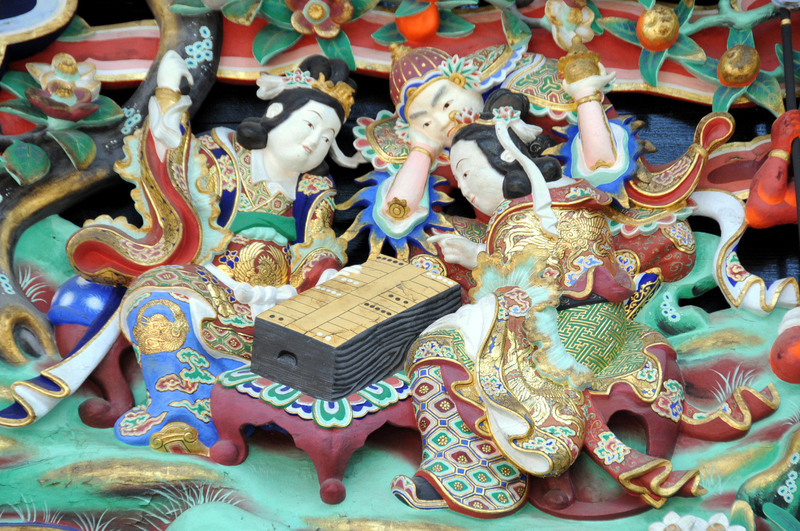 In June 2011 — thanks to a seven-year, ¥1.3 billion restoration project approved and subsidized by the Cultural Affairs Agency and undertaken by Tokyo-based Konishi Decorative Arts and Crafts Co. — all the carvings with their brilliant colors, as well as the lacquerwork and gold-leafing done by Hayashi’s long-gone artisans, came back to life. Now, as if to further gild the lily, the agency last month designated Shodendo as a National Treasure — the first historic building in the prefecture ever accorded that status. But that happy ending could have been very different if the repair work had been delayed by just a few more years. By then, damage to building would have been so extensive as to make it impossible to restore it to its original shape and look, says Katsuhiro Utsumi, a structural designer and engineer at the Japanese Association for the Conservation of Architectural Monuments, who supervised the restoration project. As he has done during similar projects at other government-designated cultural properties across the country, Utsumi oversaw the work at Shodendo by keeping in close contact with craftsmen on the ground as well as scholars working with the agency, which has the final word on preservation matters. According to Utsumi, the main challenge for the 100-strong team working there was to find out what exactly the original architecture looked like 250 years ago. That involved a lot of informed guesswork by craftsmen at Konishi Arts, since most of the original paint had come off and many carvings had lost their details. To do this, as well as using hints provided by remnants of old pigments on the wood, a technique known as X-ray fluorescent analysis was also used to study the chemical elements of the pigments. Altogether, such investigations of the architecture took two full years, he said. Then, before actually applying colors to the structure, workers drew life-size sketches of all the artistic features on a huge roll of traditional, highly durable washi paper as records for future restorers. That, though, wasn’t the only role washi played in the process. To preserve whatever traces of original pigment remained on the wood, before applying any new colors the team covered each carving with a thin layer of special washi mixed with stone powder. Meanwhile, lacquering was another headache, Utsumi recalls, since much of the wood was so damaged it soaked up large amounts before a surface coat could be applied. Craftsmen also had to fill chipped or cracked wood surfaces with a mixture of lacquer, sawdust and rice starch, which they then whittled and sanded back to the original shapes. The proof of the pudding, though, is easy for Chief Priest Eizen Suzuki to see. He said that the temple’s new look — and its upgrade from Important Cultural Property to a National Treasure — has pulled in more people. In fact, it used to only have five or 10 visitors a day. Now, there are up to 200 daily, he said. 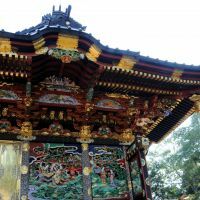 This has not only helped the temple’s finances and the local economy by attracting tourists, but more importantly, Suzuki said, it has made people in the community become aware of the role the temple, which is popularly known as Shoden-sama and believed to bring good luck in this life.